Gbenga Shobo is the Deputy Managing Director of First Bank of Nigeria Limited. He joined the Board of the Bank in 2012. Prior to his appointment as Deputy Managing Director, he was the Executive Director overseeing the Retail Banking/Public Sector businesses in the Lagos & West Directorate and was hitherto the Executive Director overseeing the Retail Business in the South Directorate. Gbenga began his professional career with Coopers & Lybrand Chartered Accountants as an External Auditor and Tax Consultant. Over the course of his outstanding career, he became the Divisional Head, Corporate Banking Division of MBC International Bank Limited and subsequently, the General Manager, Corporate/Commercial Banking of FBN (Merchant Bankers) Limited before joining the Bank. 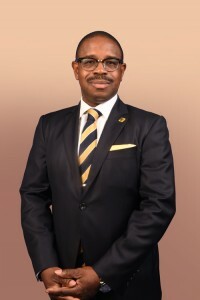 At FirstBank, he has served in senior management roles at various times as the General Manager Products & Channels Group; Business Development Manager in charge of Rivers & Bayelsa States; and also held the position of Group Head, National Corporates. Gbenga has over 30 years’ work experience from reputable organizations out of which he has garnered more than 26 years in the Banking Industry in Credit & Relationship Management; Products Development & Improvement; Treasury; Product Sales and Banking Operations, amongst others. He is a Fellow of the Institute of Chartered Accountants of Nigeria (ICAN) and an alumnus of Kellogg School of Management and Harvard Business School. Gbenga also holds a B.Sc. Degree in Political Science from the University of Ife. In addition, he has taken various courses and attended various programmes in top-rated business schools including The Wharton School (University of Pennsylvania) and Stanford University. Gbenga is the first person to be appointed to the position of Deputy Managing Director of FirstBank in the Bank’s over 120 years history, a testament to his total commitment and professionalism. He is happily married with children and loves reading, playing golf and lawn tennis.